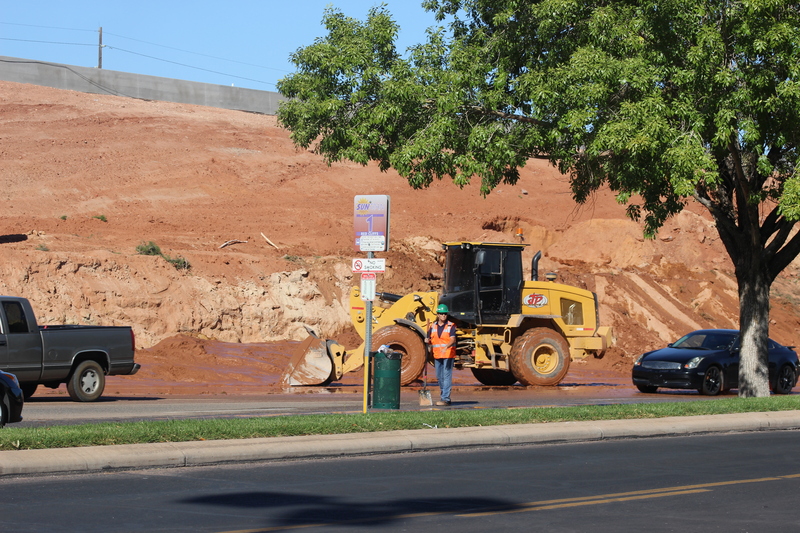 ST. GEORGE — Crews working on the new underpass connecting Red Hills Parkway to Red Cliffs Drive Tuesday got a drenching surprise at approximately 3 p.m. when a bulldozer broke into a 20-inch water main, sending water and mud cascading into the streets and over the sidewalk in front of the Red Cliffs Mall. Crews from the contractors involved in the construction project and St. George City banded together in isolating the line from leaking any more water and cleaning up the road and sidewalks. The break was caused by the water line not being buried as deeply as the workers thought, Mortensen said, adding that the crews decided not to repair the line immediately. Mortensen said clean up is expected to be completed by late Tuesday evening. Let’s go ahead and build the new road, pave it, then dig it up to fix the broken water line underneath. We will fill the brand new road back in and leave a little speed bump so everyone can see that we fixed it. Brilliant!!!! Why didn’t I think of that. Anyone ever heard of blue stakes??? LOL this is funny ! you know why ?.. watch this ..hey RealLowlife you can’t blame this on me I don’t have a job ! so it couldn’t of been me eh ? ha ha ha ha LOL ! this is funny stuff get some help. .God bless you my fellow brethren. hopefully you can get some help with your anger issues. and we can become really good buddies ! LOL ! Ha ha ha ha ha ha now that’s some funny stuff right there eh ? You have a job? Don’t think so. If you do, it is a part time job that does not drug test. You simply have too much time on your hands. You account for over a third of all comments here, with your opioid induced diatribe.